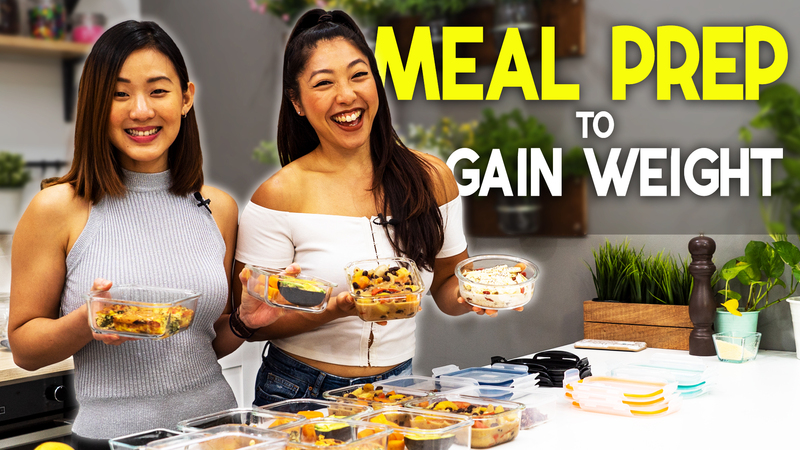 I’m going to share with you 3 really fun lunch box recipes which are delicious, nutritious, and can be made ahead. 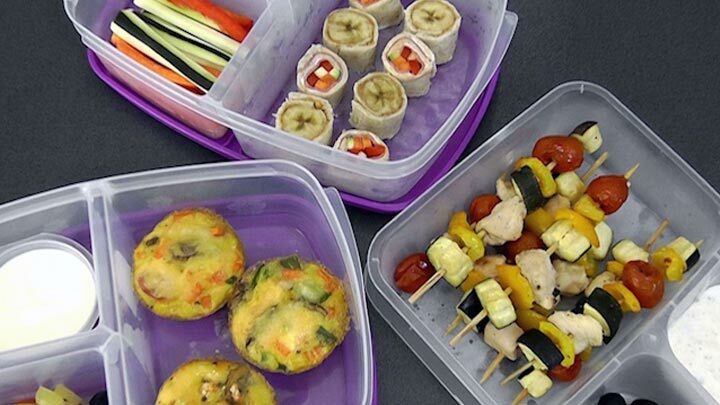 Pack it to work or school and share these yummy bites with your friends. I’m already excited, so let’s start cooking! I love baked chicken kebab skewers! That’s because you get to dip and bite into a little bit of everything. 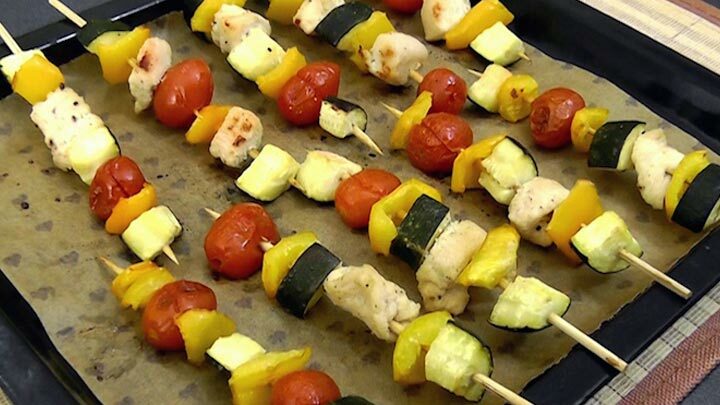 It’s a really fun way to add variety and enjoy baked chicken and vegetables on a stick. 1) The first crucial step is to soak the bamboo skewers in water for at least 15 minutes to prevent them from burning in the oven. 2) In a small bowl, combine lemon juice, olive oil, garlic powder and salt & pepper. Set aside. 3) In a large bowl, combine chicken cubes, bell pepper, zucchinis, cherry tomatoes and marinade mixture. Mix until evenly coated. 4) Allow the meat and vegetables to marinate for at least 20 – 30 minutes to keep the meat tender and to enhance the flavor. 5) Next, pre-heat the oven to 190 degrees Celsius or 375 degrees Fahrenheit. 7) In a bowl, combine ½ cup of greek yoghurt, with 1/8 teaspoon of garlic powder, dried chives, parsley and cayenne pepper each. Season with salt & peper. Set aside. 8) Thread the marinated meat and vegetables onto the soaked wooden skewers and place onto baking tray. This would make about 8 – 10 short skewers. 9) Bake in the oven for 15 minutes, turn over once, and continue baking for another 15 minutes until chicken is cooked through. 10) Remove from oven and allow the chicken skewers to cool down. I’ll pack my chicken kebab skewers with ¼ cup of the ranch dip served with ¼ cup of olives. You HAVE TO dip the skewer into the yoghurt ranch dressing. It’s so flavoursome. This is a great way to add colourful vegetables into your diet and avoid overeating. When you have 8 – 10 skewers for lunch, trust me, you’ll be satisfied! Another really fun idea is to turn the boring sandwiches into mini sushi rolls! Well students, if you can’t cook, this is the perfect recipe for you. Absolutely no cooking is required, and you can assemble them in less than 5 minutes. Sweet or savory? I can’t decide, so let’s make both. 1) First, cut the crust off on all sides of two breads. 2) Then use a rolling pin to flatten the breads as thin as possible. 3) On one bread, spread a thin layer of cream cheese. Top with turkey slice, zucchini, carrot and bell pepper sticks. 4) Firmly roll the mixture up and press to seal into a roll. 5) On another flatten bread, spread thin layer of peanut butter and place banana at one end of the bread. Roll it up firmly. 6) Finally, cut each roll into 4 even pieces. Now, let’s put your chopsticks skill into test! Eat these sandwich sushi rolls with chopsticks instead. What I love about this is that because you’re talking smaller bites, it makes you think and feel like you’re eating more. I’ll pack them with the extra chopped up vegetable sticks, served with ¼ cup of greek yoghurt ranch dip from the previous recipe. These are so fun to look at and eat. Your friends would definitely want to steal some. Let me know in the comments below. And finally egg muffins for lunch! I have previously shared this recipe in my make-ahead breakfast video. But these egg muffins are also great as a lunch-to-go. They are high in protein, packed with vegetables and so convenient to eat. 1) Pre-heat the oven to 180 Celsius or 350 Fahrenheit. 2) In a large bowl, combine mushrooms, carrots, corns, cherry tomatoes, bell pepper with olive oil. Mix well. 3) Equally distribute the vegetable mixture into each muffin cavity and set aside. 4) Crack 4 eggs into a bowl and lightly beat with a whisk. Add salt and pepper to taste and whisk to combine. 5) Pour the beaten egg equally into each cavity. 6) Finally, top with a little bit of grated cheese. 7) Bake in the oven for about 20 minutes or until muffins are set, eggs are cooked through and are lightly golden. 8) Allow the muffins to cool down for about 10 minutes. 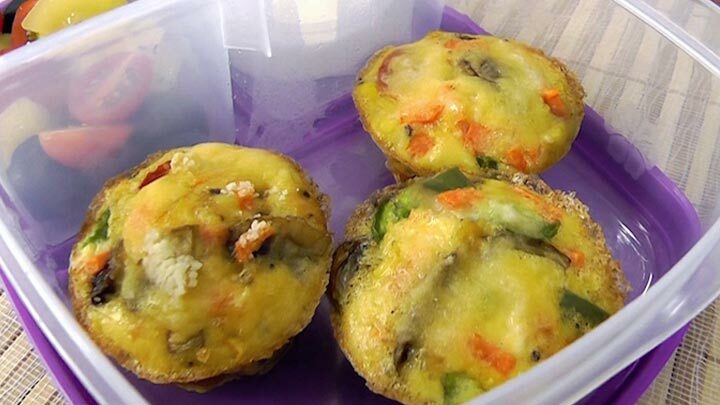 I’ll pack 3 mushroom egg muffins into my lunch box with 1 cup of fruit mixture and ¼ cup of greek yoghurt. These eggy muffins are soooo delicious and each one is only 78.5Cals. You have to try them! All these recipes can be eaten both warm and chilled. They can be stored in the fridge for up to 3 days. So this makes it very convenient for you to prep your lunches ahead. 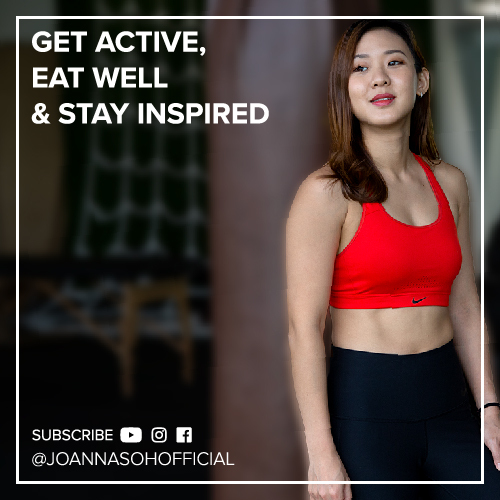 What I love about all these recipes is that once you get the basic idea, you can repeat the recipe with different ingredients so that you won’t be bored eating the same lunch box over and over again. For instance, you can choose other meat and vegetables for the kebab skewers. 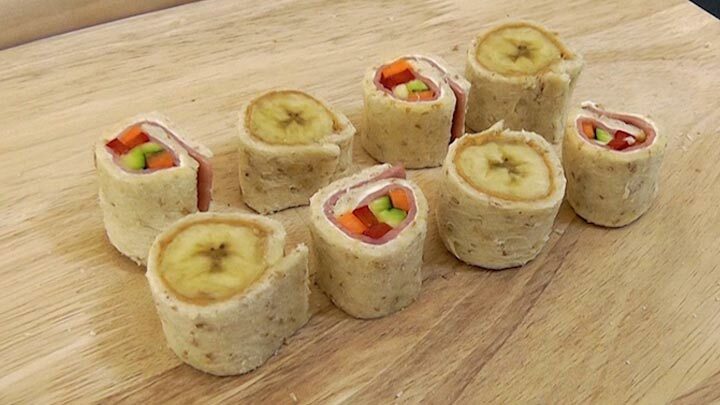 You can make different sweet and savory fillings for the sandwich sushi rolls and same goes to the egg muffins. You can add any vegetables and even meat for the muffin fillings. So I hope these simple, fun, delicious and healthy recipes will get you excited about lunch. Make them, share them with your friends, snap and post a picture, tag me and let me know which is your favourite in the comments below. All the best!